This is our detailed guide and review of the best coffee machines on the United Kingdom market right now. You are probably already aware that there are a number of different types of coffee machine, or coffee makers available. Before making any buying decision it is worthwhile taking a little time out to try and understand what the different types of these actually are. The type that you eventually buy will determine the types of coffee that you can make. What Brands Make Coffee Machines? All of the usual kitchen brands make various types of coffee makers. There are also specialist coffee brands and we have included the most popular brands just below. There are other brands like Aerobie Aeropress, Russell Hobbs, Bialetti, Melitta, Sawn and Kitchen Craft. This of course is always good news for the buyer as it ensures plenty of competition, which does help to keep the prices down. It does however mean that picking the right one for your own personal or home needs can get very confusing. There are so many choices it can get quite bewildering. 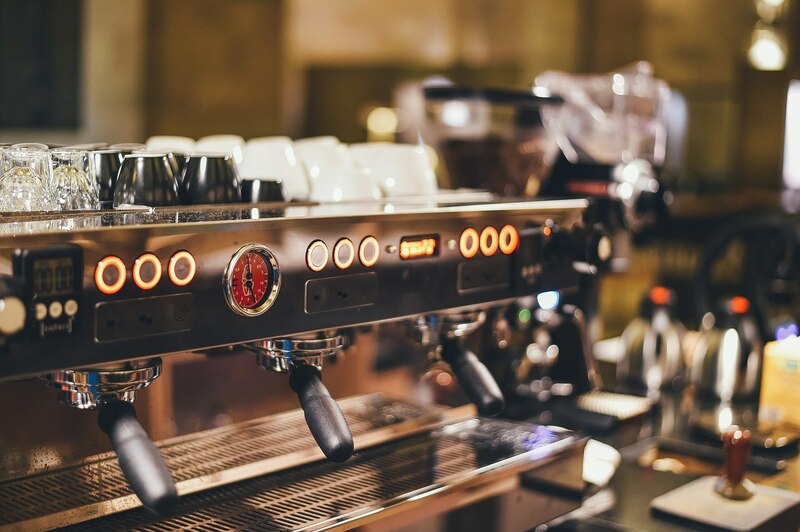 The one thing we would highly recommend, before buying any type of coffee machine, is to make yourself aware of the various types of machine that are available on the market, and what type of coffee each of these machine types can actually make. We have shown those below to make that a little easier to fully understand. Below I have listed the different types along with a brief description of each different maker. You will then find a link that will take you to a page that goes into each in a lot more detail of the particular type of coffee machine and with a Top 5 list, where you can find more detailed reviews. These are a very popular choice for many UK buyers. Around 20% of all coffee makers bought in the UK are this type of capsule or pod machine. You will hear these referred to by slightly different names, either capsule, disc or pod. You find these in many hotels, Guest Houses and B&Bs as they are convenient and a handy way of making great tasting coffee. Two brands dominate the UK market for these and they are the Bosch Tassimo and The Nespresso Dolce. Each of these brands has a range of different looking models. These can cost between £40-200 depending on the brand, the model number and the features that you want to have. They can make coffee, latte, cappuccino, teas and hot chocolate. They are simple to use as you just have to push one button. Typically they are small and compact. Most will have a removable tank which you fill with water. You then add a disc or capsule and push the button to get your coffee. Quite a few of these brands also include a self-cleaning function, which means that your machine is always ready for the next brew. These are a popular choice for people who like a quick cup of coffee, are limited for worktop space, and as such are good for apartments, people who live on their own, or for couples. If you don't have the time to read about those in detail and want a quick answer, then look just below. I have included our recommendation on the best capsule machine, and also on the best pod machine, with some details. There are 16 different blends of coffee drink so you should be able to find one that suits your taste. This is the machine that I keep in my home office and it makes really good coffee, but is also simple to use and to look after. These have been around for a very long time and if you like filtered coffee, then these will be the best choice for you. With these you basically can make a pot or carafe of coffee, so ideal if you are serving coffee to a number of people. At the low end these cost about £20. If you want something with more features such as a grinder, built in, a nicer appearance and other such features, then expect to pay about £70-100. These machines have improved a lot over the years compared to very basic set-ups when they first came out. The designs and colours available are now are so much better for the kitchen, and they are also faster and a great deal more efficient than they used to be. Filter coffee is made by flooding hot water over medium sized ground coffee grains. The grains go into a filter, and the water goes into a tank. There the water gets heated and then covers the ground beans in the filter. The coffee then drips down into the carafe below to make your pot of coffee. Filter machines do need quite a bit of cleaning after they have been used. You will always need to clean the carafe, and you will always need to clean the permanent filter. Once a month or so, you may also need to descale the machine. If you don't have the time to read about those in detail and want a quick answer, then look just below. I have included our recommendation on the best filter coffee maker with some details. Coffee grains are added, and then pushed out under highly pressurised water to make a rich espresso. This pressure is often measured in "bars," and the coffee does taste really good indeed. These come in different styles, brands and varieties and on average they cost around £50-£100. The price range does vary quite a lot though and these can go all the way up to £250 depending on what you are looking for in a machine. Many of these combine both espresso and cappuccino capabilities. The espresso is the basic core coffee that is the basis for most coffee types. These types of machine make an espresso, and from that you can add water to make an Americano, add milk to make lattes etc. The brands and models vary a lot, as do the range of features on each machine. Bar pressure is very important with these machines. These bean to cup coffee machines are now quickly growing to become the most popular on the market today. As the name implies you simply buy the beans of your choosing into the top of the machine, and from there when the machine has finished the process, you have the perfect cup of coffee. The reason for that is that these machines also come with a built-in coffee grinder, which grinds the bean freshly, for the ultimate in fresh taste. Now these are more expensive with an average price of around £100-150 for a basic version. They do go all the way up to around £350, depending on what other features you like to have. All of these machines will have a frothing arm for steam. If you want great tasting coffee of all kinds, then something like this one will be ideal. I call these the Rolls Royce of coffee machines. They do take some time to learn how they work especially if they have timers and programs. The good news is to make a basic espresso is actually very easy. Like the espresso/cappuccino machines there are a lot of these on the market, so making a choice can be difficult enough. The actual brewing unit can be removed for easy cleaning. There are a wide variety of these available on the UK market. The prices vary widely depending on the exact model that you want to pick - These vary from around £25 and then up to over £100 depending on the type of machine you want to own. Please note this is NOT espresso coffee, as it simply makes a strong short coffee very quickly. This type of pot really does make excellent espresso. There are no fancy gadgets with this to froth milk, no programs and no timers. It is basic in its operation but it is an affordable way of making really good coffee. I have a couple of these myself, a small one when it is just for me, and a slightly larger one if I need to make coffee for more than just me. These are actually quite fun to use and they do create a lovely aroma in the home. They come in many shapes and styles, and they do come in a range of colours, with the stainless steel versions being the most popular. These are also quick and easy to use. They are easy to use and the process is simple. All you need to do is buy some ground beans, like Lavazza Red, and then follow the instructions that come with this pot. As soon as the pot boils you will hear a gurgling sound, and that is when you should turn this off the heat. If you leave it on too long, the coffee grains will burn and your coffee will taste very bitter. Personally my wife and I have 4 different types of coffee machine in our house. I have to hold my hands up to being the guilty party as I do love my coffee. I also like variety and convenience. I have a Bosch Tassimo pod machine in my home office, a Delonghi Bean to Cup in my kitchen as my main coffee machine, a Melitta filter maker and a Vacuum coffee maker. For years I only drank filter coffee and those machines have improved a lot over the years. However I wanted what I call a "proper coffee machine" but didn't want to pay the big money for that. I did give in though and got one for Christmas. That lasted about 3 years before I replaced it with my Delonghi. It is really hard to pick just one good coffee machine for your home. That is especially true if you like different types of coffee. Many coffee lovers like me do end up with a number of machines. My advice would be to consider all three of the choices of lifestyle, budget and how much you love your coffee. If you just want great tasting coffee without a great deal of work, I would highly recommend either a capsule or pod machine. They make great tasting coffee and they are really simple to operate. Some of the models are really cool looking and there is very little maintenance with them. The only real disadvantage is that they only work with whichever brand of pods or capsules (discs) that the brand of your machine uses. You can of course buy a stove top espresso pot. The only drawback with these is that you do have to keep an eye on them. If you are in a hurry in the morning it is all too easy to forget about them. That said they do make excellent espresso and you can then top up with water to make an Americano. That is their limit though, so if you prefer a different type of coffee drink, these will not be for you. If you just want the type of coffee that you can get in Starbucks, Costa or your favourite coffee shop, then you need some type of a espresso/cappuccino machine, or a bean to cup machine. I call this taking your coffee drinks to the next level. If you have a grinder then you buy the beans of your choice so as they are always fresh. Then you grind them to suit your machine (fine grind for an espresso), and then let the machine do the work. With just a few attempts you really do get a great tasting espresso. When you have that, then you can turn that into your own favourite coffee drink, by adding water, milk, froth, cream etc. If you just want the best then buy a bean to cup machine. They are not cheap but you will own the Rolls Royce of coffee machines. If you have one of these then it really is a matter of buying some fresh coffee beans. Your machine then does the rest and you simply enjoy the taste. I know that many people will not be able to afford one of these. Avoid the really cheap versions of these though as they are really bad. The good ones cost around £300-800. I have seen these as cheap as £150, which I know is not really cheap, but the reviews are simply terrible. If you have the money, and you want a good machine, then do spend £300+ and get a really good one. This type of machine will of course bring your coffee making skills to the next level. They are a very good option if you want to find out more about making the full range of coffee drinks, or if you are someone who likes to entertain. What is really important about these machines though is that it allows you to buy and use fresh coffee beans. Most of these then have a built-in burr coffee grinder. There are two main types of coffee grinder available. One uses a blade to chop the beans into pieces, and the other type uses a set of burrs to squeeze the beans into grains. The burr style is by far the best option of the two. Most good quality bean to cup machines will have a burr grinder, and I would recommend buying only a machine that has a burr grinder. It just makes a much better fuller flavour coffee. It is also worth mentioning that you can buy filter coffee makers with a built-in grinder as well. When I use the word "fun" I am referring to the process of coffee making. The easiest method in the world to make coffee is to buy a jar of instant coffee, boil a kettle and then add milk and/or sugar to suit your own tastes. Nothing could be simpler, and let's face it there are a whole range of instant coffee brands to try out. However that process would hardly be described as being fun. if you like to make coffee house style coffee, then by moving up to a filter machine, an espresso machine or a bean to cup machine, then you can certainly have a lot more fun. That is when you can make the entire range of espresso based coffee drinks. You can get to use the steamer, froth maker and experiment with a wide range of coffee bean types. For something different though I would suggest trying both drip coffee making and also vacuum coffee making. The vacuum method is an extremely interesting coffee making method. I first saw this in a coffee shop in Rhodes and it really caught my eye. I would even go as far as to say it was very dramatic. If you have managed to get to the end of this article, then I hope that you are a little bit better informed about the types of coffee machines that are available on the UK market. I have always believed that lifestyle mainly drives the type of coffee machine that you will go for in the end. if you just like a quick cup of coffee in the morning, or want to make one quickly, then the pod/capsule machines do that really well. There is also very little cleaning to worry about. For buyers wanting to be able to make a good quality espresso, and then turn that into a latte, Cappuccino etc, then a good quality espresso maker will certainly do that. if you want the ultimate then go for a bean to cup, but be prepared to pay for that. Filter coffee is a coffee in its own right, and you will either love it or just not be so fussed on it. I do like it for a change from time to time, and the filter coffee makers are not expensive. They do take up a bit of room though so just be aware of that. If you like a traditional method for making strong coffee, then the stove top espresso, or a percolator will certainly tick those boxes. Finally if you like something different, try out a dripper or the vacuum method, which are really interesting brewing methods. Happy coffee making with whichever machine you end up choosing.